In recent times, business turn-out and revenue has reduced drastically, so many businesses are closing down and the rate at which that is happening is on the increase daily. There are so many factors that churn out bad business outcome, and the economy crisis is also part of it. Businesses are now thriving based on survival of the fittest and you definitely won’t be among the survivors if you’re not getting the latest information that will help scale your business. The trends are changing and are doing so fast, if you can’t meet up, you’ll be kicked out! 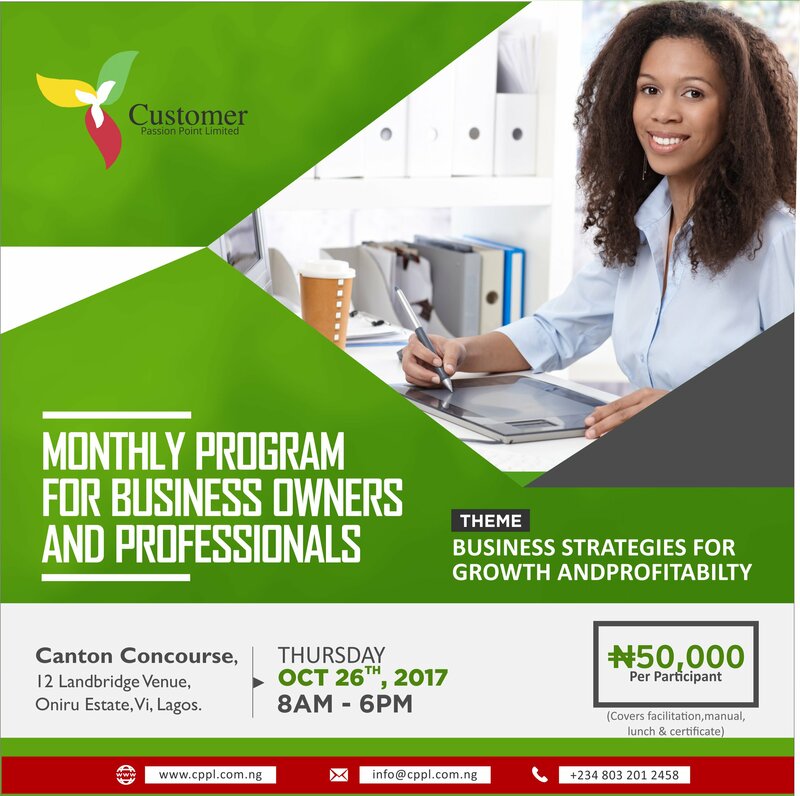 That is why Customer Passion Point Ltd. is putting up an executive practical approach on strategies that should be adopted for the growth and profitability of your business. You don’t get to see such rich content as this always. To understand the rudiments of marketing and the marketing planning process so that participants can develop a simple and practical marketing plan to drive growth and profitability of their businesses. To understand how to make effective sales pitches for products and services to existing as well as potential customers in a way that ensures that sales are made on a sustainable basis. To understand how to manage customer relationships to maximise and motivate customer loyalty and advocacy. Anyone involved in managing projects. Venue: Canton Concourse, 121 Landbridge Venue, Oniru Estate, VI, Lagos.